While it is not always possible to detect when labor will come, as the big day approaches, you can change your eating habits so that when you do go into labor you will be prepared to get through it. Some obstetricians don't allow you to eat once labor has started, so fueling up beforehand will give you the energy you need to give birth, according to What to Expect. Talk with your doctor for additional advice specific to your pregnancy. Fresh fruit is refreshing, but it will also give you a quick burst of energy. When your water breaks or you prepare to have your labor induced, a piece of fruit can give you enough energy to get through labor and delivery. BabyCentre ranks bananas as one of the best pre-labor fruits, but any fruit will give your energy a boost, so eat the ones you like best. Many women vomit during labor so avoiding citrus fruits will make this less painful if it happens to you. Eat fruit on the way to the hospital since many doctors won't allow you to eat once you are prepped for labor. If your doctor does allow this, you can often get fresh fruit from the hospital cafeteria. 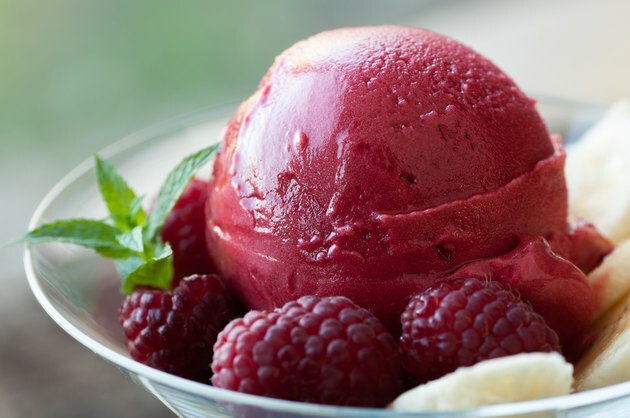 Sorbets or frozen treats made with mostly fruit are good alternatives if you don't feel that you can stomach solid food; both are often allowed in the labor and delivery room if needed. Yogurt contains sugar and carbohydrates, both of which will give you a good energy boost as you prepare for labor. Keep your refrigerator stocked as the time becomes closer so that you are able to eat some right away when labor becomes imminent. Yogurt will give you the energy you need when labor begins, and you must work hard to bring your baby into the world. If your doctor won't allow food once you reach the hospital, eat some yogurt before or during your ride to the hospital for prolonged energy. Watch out for yogurts that are high in sugar as they can upset your stomach and cause vomiting once active labor starts. Stay away from pasta floating in sauces because they can upset your stomach. However, plain pasta is bland and full of carbohydrates. Eating plenty of carbohydrates before you begin labor will give you sustained energy that is released slowly and steadily over the next several hours of labor. When you feel that is labor is about to occur, cook up a plate of plain pasta to get you ready for the big event. If you feel that labor will sneak up on you, and you won't have time to eat beforehand, keep some already prepared pasta in your refrigerator so you can eat some quickly when the time comes. Whole grain pastas will give you an additional dose of energy.